Nina Katchadourian's foreign-born parents, who have lived in the United States for over 40 years, both have distinctive but hard-to-place accents that the artist has never been able to imitate correctly (and have not inherited). Inspired by posters advertising courses in "accent elimination," Katchadourian worked with her parents and professional speech improvement coach Sam Chwat intensively for several weeks in order to "neutralize" her parents' accents and then teach each of them to the artist. The very existence of these courses points to the complexities of assimilation and self-image, and the tricky maneuvering between the desire to preserve the distinctive marks of one's culture, on one hand, and to decrease them in order to seem less foreign, on the other. In the video, Katchadourian's parents and the artist struggle to hear and imitate what is so close at hand and yet so difficult to access. The accent is treated very literally, like an heirloom, and the project illustrates the very awkward attempt to concretely transfer this elusive, and ultimately culturally determined, attribute. This is a six-channel piece, with the front "talking head" monitors showing a synchronized conversation, scripted by Katchadourian's parents, which plays out first in their natural accents, and at the end in their "reversed" accents. The middle section consists of outtakes from practice sessions in the artist's studio, and has been edited to play with the patterning and repetition of various words. This work included as part of an exhibition of work by contemporary artists from the Armenian Diaspora in the Venice Biennale 2015. Talking Popcorn is a sound sculpture that evolved out of the artist's interest in language, translation, and Morse Code. 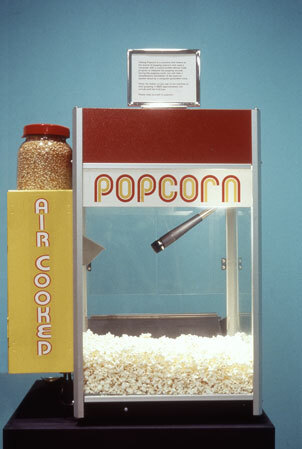 A microphone in the cabinet of the popcorn machine picks up sound of popping corn, and a computer hidden in the pedestal runs a custom-written program that translates the popping sounds according to the patterns and dictates of Morse Code. A computer-generated voice provides a simultaneous spoken translation. The computer program for Talking Popcorn was written by Josh Goldberg using Max/MSP. Since Morse code consists of a system of long and short sounds, and popcorn only pops in short sounds, the first challenge faced was how to overcome this disparity. Katchadourian remembered that the doomed sailors on the Russian submarine Kursk had tried tapping out messages on the hull. If this was possible, it must be a matter of pacing the knocking differently in order to communicate long/short marks. This is in fact what Talking Popcorn does: it listens to a series of pops in a group, taking a running average of the amount of silence that follows each pop, and then designates each of those pops as a dot or a dash. Measuring the lengths of silence in groups also helps account for the acceleration that happens as the kernels heat up and pop and peak speed and density. Talking Popcorn blurts out words in many different languages, but ultimately it speaks a "language" very much its own (one person dubbed it "popcornese"). When this piece is exhibited, Kathadourian has keeps a daily journal of the popcorn machine's speech, placing samples of popcorn inside a vacu-formed capsule next to a text panel that shows everything spoken by the machine on that particular day. One of these capsules is hung on the gallery wall at the end of each day of the show. In a play on the tradition of bronzing a baby's first shoes, Katchadourian bronzed the popcorn machine's first word, "WE," (dot dash dash, dot) and preserved these kernels in a wooden jewelry case (Talking Popcorn's First Words, 2001).